NEW DROP-OFF/PICK-UP QUILT SHOP LOCATION! I spent time this week getting organized. So many things were getting piled up in corners, on my cutting table, on my ironing board, and of course on the floor. My desk of course is a whole other mess in and of it’s self. 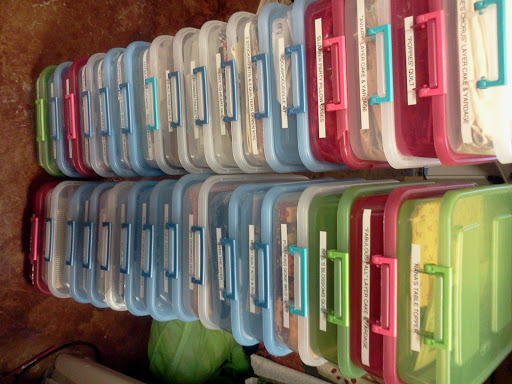 My first order of business was getting all my projects sorted and put in containers. I really like the 6.2 Qt. Sterilite containers from WalMart. They are $4 each, cheaper than the ‘Project Bags’ I originally was keeping some of my projects in. I’m pretty sure I bought out the WalMart in Saratoga Springs. I think there were about 5 left when I was last there… So then I used my “P-Touch” label maker to identify the quilts inside each container. I’m a little embarrassed to say that I have 48 projects that are in various stages of completion. My next project was getting all of my bolts of fabric together. Some were on different shelves on opposite sides of my room and I had 6 bolts of Minkie standing up against my shelves on the floor collecting dust bunnies. Those all got put together on one shelf. Then I spent time vacuuming all my shelves. I don’t think that I’ve truly dusted some of my upper shelves for the last three years (This is really confession time…I hope no-one thinks less of me 🙁 ). You need to understand that my shop is my garage made over. My ceilings are about 16 feet high. I had lots of bags of fabric from completed projects that I didn’t know what to do with so I just put them in zip-lock bags. They weren’t doing any good to me there, so I sorted all the fabric into ‘Darks,’ Mediums,’ and Lights.’ I folded them and put them in separate drawers of a 3 drawer plastic stand. (I’m not sure what they are called…sorry). My left-over batting from my old quilts somehow had taken over a corner of my floor. Some of the batting was from mis-measuring for customer quilts and so was 96″ wide, but unusable because it was not measured and labled, I cleared 3 shelves and they will contain the batting that will be folded and measured. I love the new ‘Batting Seam Tape.’ It is 10ft long and allows me to ‘seam’ two pieces of batting together to make two smaller pieces into something I can use for a larger quilt. This will be useful with my batting all measured and where I can easily see it to decide which pieces together will make the size I need. As I went through everything I threw away a full trash can of old stuff that I will never use. I feel really great when I look at my room now. Everything has a place and now I can easily find what I’m looking for. My cutting table is cleared and Ironing table is actually ready for use without having to remove anything from it…..
Now, the hard and not so fun project of re-organizing my office… I wonder if I can possibly find ANYTHING else I could do to procrastinate….Hmmm, well now I know of a few quilts that I would rather be working on….and I know just where to find them. © Copyright 2012 Eagle Mountain Quilting. All Rights Reserved.